Audiopolis #16. Friday 6th of November, 2015. 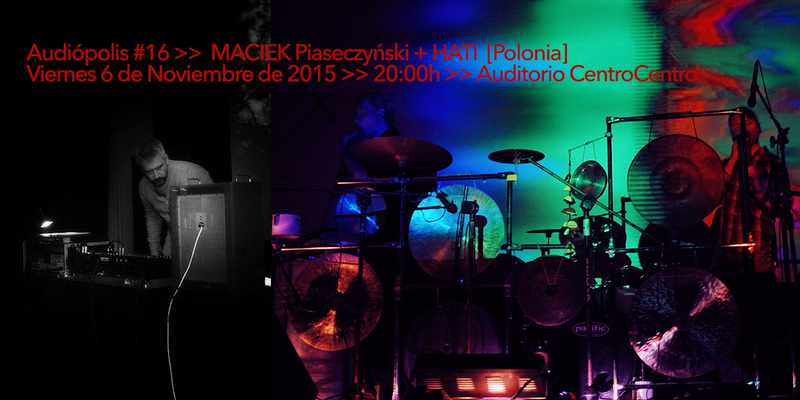 Friday November 6, 2015 will be held the last edition of the series of experimental music “Audiópolis”. This time guests are Polish musicians, Maciek Piaseczyński and the group HATI consisting of Rafal Iwanski and Rafal Kołacki. As always at 8:00 pm in the auditorium of CentroCentro. We wait for you! In 1995 RW started working on the next project – Story of Alfons Czahor. The sound elements for the project had been collected during journeys to eastern Poland. The realization of the album was based on the recorded and transformed sounds of nature and folk songs. 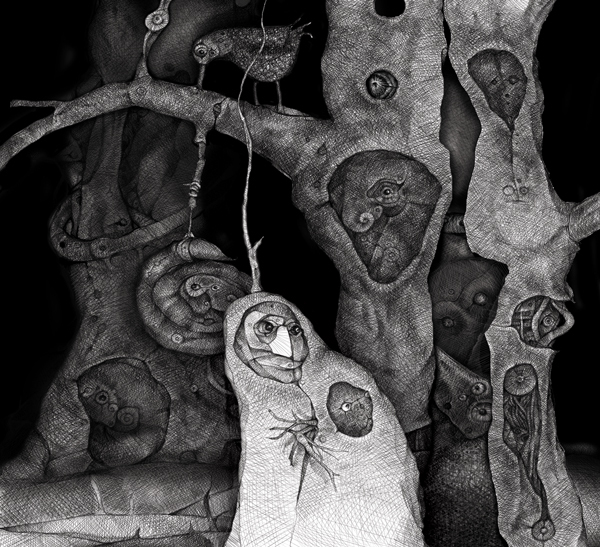 It was inspired by the legend of the mysterious figure of Alfons Czahor. And the result was a spiritual sound story like a ritual set in folk of eastern Poland. The recording was issued by Obuh Rec. The project had been presented at many concerts in Poland and abroad. Today Rongwrong is represented by Maciek Piaseczynski – creator, collector of observed sounds, graphic designer. He has collected surrounding sounds for many years. Exploration of places and stories around them became artistic inspiration. Time got stuck in the tricky tangle of fates and events and an unfinished story flies by like a ghost between worlds. The past has influenced present time irreversibly and whatever is going to happen has already had its beginning. The latest Project – ‘Krwy’ has been issued by Requiem Records. It’s a sound journey to spe- cial places, related to distant history of occupation and World War Second. ‘Krwy’ is not a presentation of dramatic war happenings nor their sound reconstruction. It is an impression dedicated to the memory of the heroes of these dramatic and tragic days. It is kind of music memento which tries to recreate landscape of recollection in an artistic and experimental mode. The project is based on the composition of the sounds recorded in the places of the tragic happenings which emphasizes authenticity of the artistic message. Ghostly atmosphere escapes from the reality, blurring its contours and suppressing dramatic voices of war. However it leaves traces carrying them as metaphor into the space of memory… Archived pictures of Zdzilaw Buczek, photographer of Polish Home Army, were additional artistic impulse of the realization. I use these pictures during concerts and multimedia happenings. HATI (Rafal Iwanski & Rafal Kolacki) is a musical project from Torun, Poland based on the sounds produced by ethnic and hand-crafted instruments (gongs, percussion, wind instruments) as well as found objects. Their work combines genres that the band has a passion for: acoustic music, improvisation, sound phenomenae, trance, ritual, recycling. They have toured all over Europe and performed at music festivals such as the Unsound Festival New York (US), Linien Festival in Gottingen (DE), Fano Free Folk Festival (DK), BUT Film Festival (NL), Menuo Juadaragis (LT), London’s Equinox Festival (UK), Trans/Wizje Festival (PL), Wroclaw Industrial Festival (PL), Audio Art Festival in Krakow (PL), Ars Electronica (AT), CTM Berlin (DE). Their albums have received excellent reviews, with critics praising their unique, magical sound and powerful performances. Although founded in 2001 by Rafal Iwanski and Dariusz Wojtas, since 2007 HATI has performed as a duo consisting of Rafal Iwanski and Rafal Kolacki. Occasionally collaborating with other musicians, they have worked live and studio with Z’EV (3 albums recorded together), PAS Musique, PURE (as PRSZR). Live collaborations with John Zorn, Raymond Salvatore Harmon, Robert Curgenven, Mazzoll and many others. Members of HATI are also the curators of international CoCArt Music Festival in association with the Centre of Contemporary Art in Torun, and are active in other audiovisual and electroacoustic projects: R. Iwanski is co-founder of electroacoustic projects Kapital and Voices of the Cosmos, solo performs as X-Navi:Et; a percussionist in group Alameda 5. 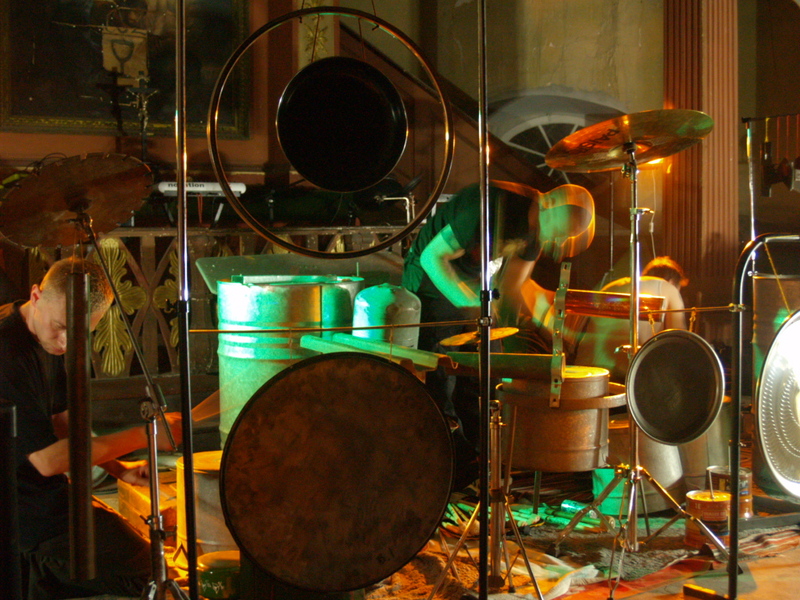 R. Kolacki is co-founder of audio-visual projects Mammoth Ulthana and Tonopolis; a percussionist in group T’ien Lai. Both are also members of group Innercity Ensemble.